This month my make is part of my effort to create core wardrobe separates that can be mixed and matched with other handmades in my closet. It's a real exercise in restraint since I am often found click, click, clicking away at florals, animal prints, and various colorful prints while shopping the Fabric Mart site! I gravitate toward striking prints and that's perfectly fine most of the time but for this month I went for subtlety! The first piece is a basic turtleneck from Kwik Sew 4069. I have seen turtlenecks everywhere lately, and was really inspired by this image from Pinterest (the place where all good ideas live!). While my turtleneck didn't turn out as form fitting as the one on Pinterest I am still very happy with the resulting garment. The fabric is a Black/Light Tan Rayon/Lycra Rib knit. This fabric is really soft and substantial feeling. It's not overly thick or thin which is great for mild winters and layering. It has great drape and stretch recovery. I am really tempted to go back and get more! You won't be disappointed in the quality! Construction and Fit: One thing I noticed about this pattern and was a little on the fence about was the shoulders, if you notice the shoulders almost appear a little dropped. I have slightly narrow shoulders and usually like my shoulders to look pretty fitted or close to it, but with this pattern I think its grown on me. I have noticed this same style line in other turtleneck sweaters as of late. The fit is also a little looser and I added 1 inch of extra length to the hemline for tucking into pants (it would probably be long enough for most people, I'm just a bit long waisted). I constructed the top using a zig-zag stitch and stretch ball point needle as well as my serger. I stabilized the shoulder seams with knit interfacing strips. My second piece is an A-line skirt from New Look 6418. I chose this pattern thinking that the style lines would add some interest to an otherwise straightforward A-Line skirt. It's a little hard to detect the lines in some of these photos but they are there! This is a great pattern and I think it would be awesome to make it up in a faux suede or microsuede as it suggests on the pattern envelope. I put a link to the pattern on Pattern Review because I couldn't find it on the Simplicity website. Tilt your head a little to make this picture straight!, my hubby gets creative with his shots sometimes! You can see the style lines in this photo! Fabric: The fabric is a black 100% wool flannel twill suiting that I believe is all sold out now. This wool is beautiful and I know I will get a ton of use from it since the quality is so good. I used a rayon/polyester lining for the inside and a regular zipper from my stash. The hemline is finished with purple lace hem tape and hand stitched. I had some of this fabric left over after construction so you may see it again soon! Construction and Fit: I really love a good A-Line skirt and I started out with this one a bit longer. After taking pictures of it on me, I really disliked the length and so went back and ripped out the bottom and cut off about an inch and reapplied the hem lace and stitching. Now it's the perfect length and the extra inch taken off the hemline seemed to remove some weight from the front. Now the hemline sits better and doesn't collapse in at the center front. It's the little changes that make all the difference! I also have a bit of a rounded tummy so I usually have to tweak the skirt front and have found a method that works for me. I start with the suggestion given by Palmer/Pletsch in Fit for Real People. They suggest you add a little fabric to the center front of the skirt, since I've usually already cut my fabric out I've found that I can reverse engineer this suggestion and just remove a smidge of fabric from each side of the center front. The picture below shows the center marked with a pin and the small bit of black wool taken from each off center spot (the gray fabric is the lining). It works pretty well for me removing most of the wrinkles, even though I still spot some pulling, blame it on the Christmas cookies! I fully lined the skirt and hand stitched the lining to the zipper. I also applied hem lace to the bottom edge, hand stitching the hemline in place. Overall I am really happy with these two pieces and I've tried some subtle styling with a Fendi belt and red Vera scarf (both thrift store finds). I like the belt for work and have been on the hunt for a belt with a gold buckle. I honestly can't decide if the belt is for men or women, its an authentic Fendi and stays put nicely so I will be wearing it regardless! What do you think-- do you think this belt is for men or women? Also, I'd be curious to know if any of you try to make wardrobe basics or are more interested in sewing whatever suits your fancy? I tend to go both ways, sewing what suits my fancy one month, to making wardrobe basics another. I have narrow shoulders, too, and almost always make a narrow shoulder adjustment--it's not hard. Thanks Wendy for your suggestion, I have also had to do some narrow shoulder adjustments in the past, all minor. However with this pattern, as seen on the envelope, it is drafted to sit just outside of the shoulder line, not a style line I usually gravitate toward but with this top I'm liking it! How did I miss this?! 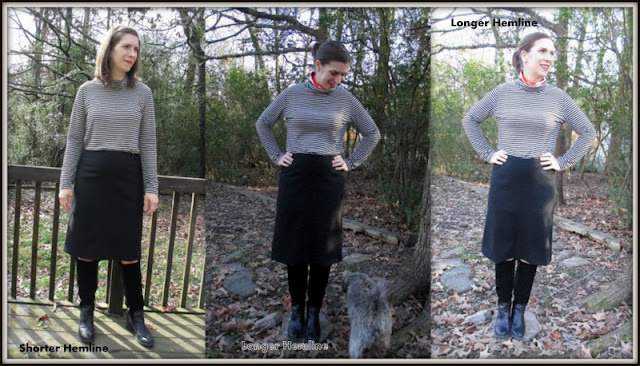 I have wanted to sew this skirt for awhile and just love yours!!! Thank you for your sweet words! Its a good pattern and I would love to make it up in faux suede!